This recipe comes courtesy of chef Dan Brophy and the In Good Taste kitchen store and cooking school. In a bowl, mix together the flour, sugar, baking powder, and salt. In a separate bowl, blend the milk, egg yolks, melted butter, and vanilla. In a third bowl, beat the egg whites with the cream of tartar until soft peaks have formed. Stir the milk mixture into the dry ingredients until incorporated. Don’t overmix. Add the chopped hazelnuts, then fold in the beaten egg whites. (Some of the egg white should remain visible.) Again, don’t overmix. Follow your wafflemaker’s instructions for filling and baking. 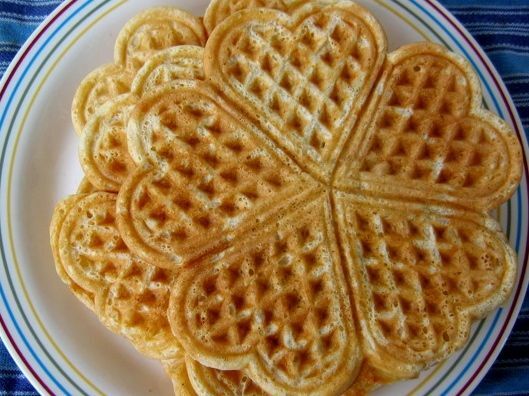 Waffles can be held in a 200-degree oven prior to serving. Culinate editor's notes: You can replace the hazelnuts with pecans or walnuts. If the nuts are minced instead of chopped, you can use just 1/2 cup nuts and still have a subtle, nutty flavor in the waffles. Read Ashley Griffin's article on the cooking class where this recipe was demonstrated.